Oh the excitement for this much needed weekend of dancing and fun is building. Brian and I are going to Dave Mathews Band concert at The Gorge Amphitheater with my brother and brother in law!!!!! Food and music are always just what I need to relax and end the Summer. We’ll be grilling up some tasty food, soaking in the perfect weather and sun. My first show at The Gorge was Phish about fifteen years ago and it was epic. We drove my brothers 1966 Volkswagen bus from Sacramento, Ca to Western Washington to visit my oldest brother, then over to the shows in Eastern Wa. At one point we were running on two cylinders going twenty miles per hour up a hill with big rigs and cars behind as far as we could see. There was construction, so there was only one lane! Oops… Dang hippies! The experience was one I will never forget, and I am grateful we got there and back safely in that bus. What a memory! Since then I have been there several times for various other concerts over the years, sans a bus. Different memories, one time I went back stage with Dave Mathews and hung out for the show, oh yes I did! He also kissed my cheek ;). So obviously I have fond memories of this gorgeous venue that overlooks the Columbia River, and who would have thought I ‘d be living a few hours away from there after so many years of driving there from California. I am so excited! Turning to the food, we will totally be grilling this Roasted Potato Salad with Greek Yogurt with some pork tenderloin and vegetables for pre show eats. It’s a beautiful setting and Labor day weekend, so naturally the entire country will be celebrating the end of Summer and we all need good food for that right? But right now in my area it’s raining, so I roasted the potatoes in the oven because it’s always good to have a couple of options for cooking the good eats! 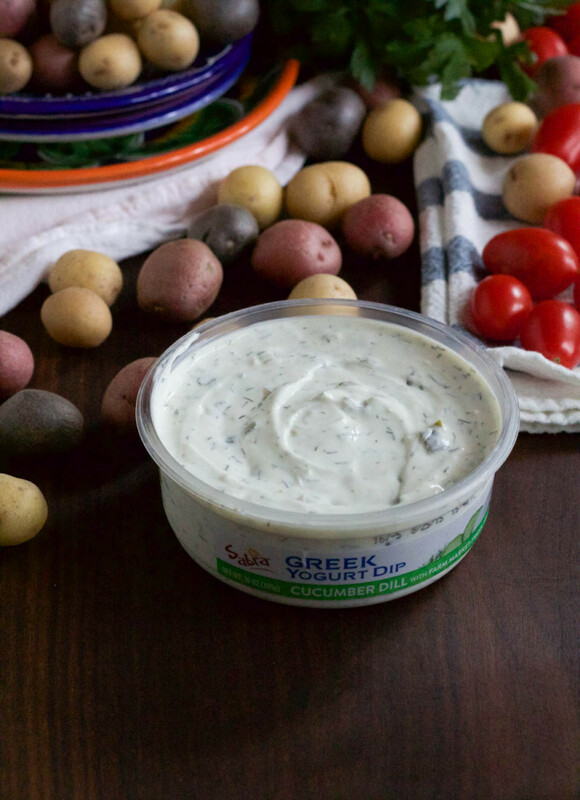 Plus look at those fresh chopped vegetables and herbs in the Sabra Greek yogurt dip below, they are so fresh and so good! Plus with fresh sweet tomatoes and peas still at the markets and in season, of course I’m going to add more goodness to this salad. Because Summer! Grilling: You can also grill the potatoes instead of roasting them. Toss the potatoes with olive oil, salt, and pepper. Place them in foil, or a cast iron pan, or open grate grill safe pan, cook until tender, about 20 minutes. Both are equally tasty, it just may be raining where you are, like it is here, so roasting can be a helpful alternative. Plus you can make these all year long! Here is a $1 off coupon for any Sabra product for all of your grilling, party, and tailgating needs! Place oven rack in top third of oven, and preheat to 450 degrees. 1. Place potatoes, olive oil, salt, and pepper on a parchment lined baking sheet, toss to combine. Place in oven and bake for 20 minutes. Remove from oven and allow to cool for 30 minutes. 2. 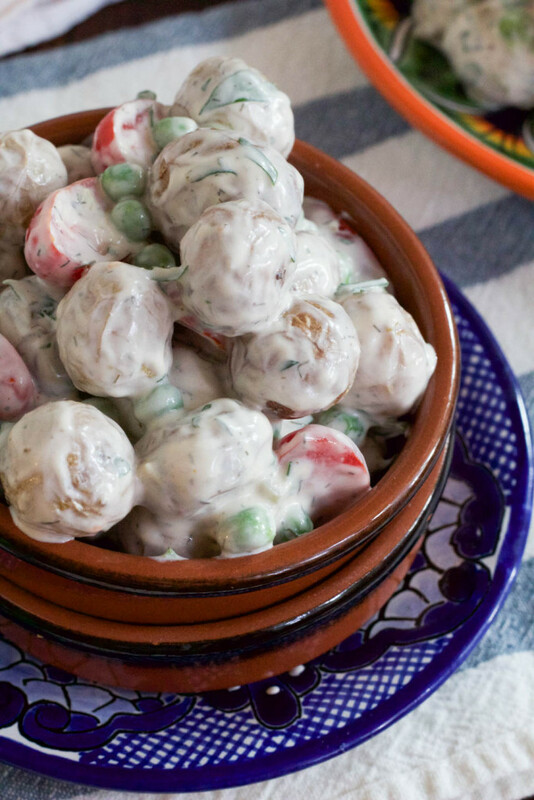 Place potatoes in a large bowl, add Greek yogurt , peas, tomatoes, and parsley, toss to combine. Serve immediately, or store in an airtight container for up to 3 days. 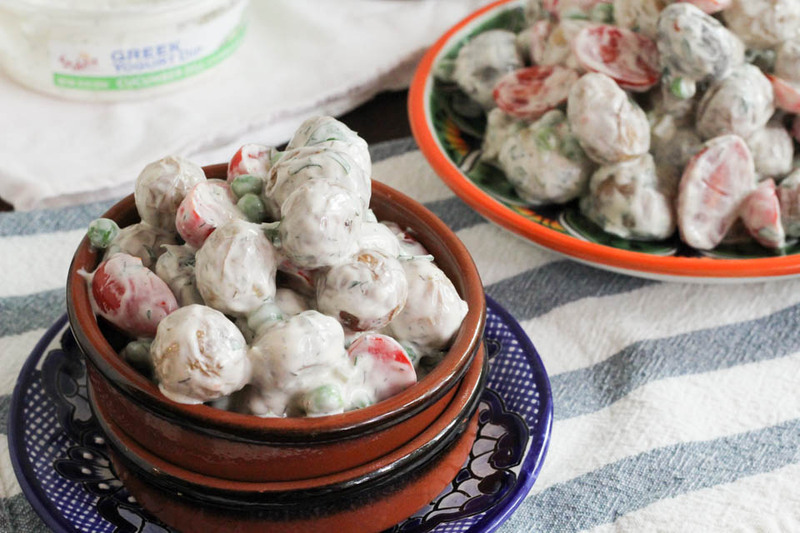 Awesome Greek Yogurt Recipes from NJB and my Sabra Tastemaker blogging friends! Jealous of your concert fun! Have a great time! This potato salad looks amazing! So much fun! Thank you :). 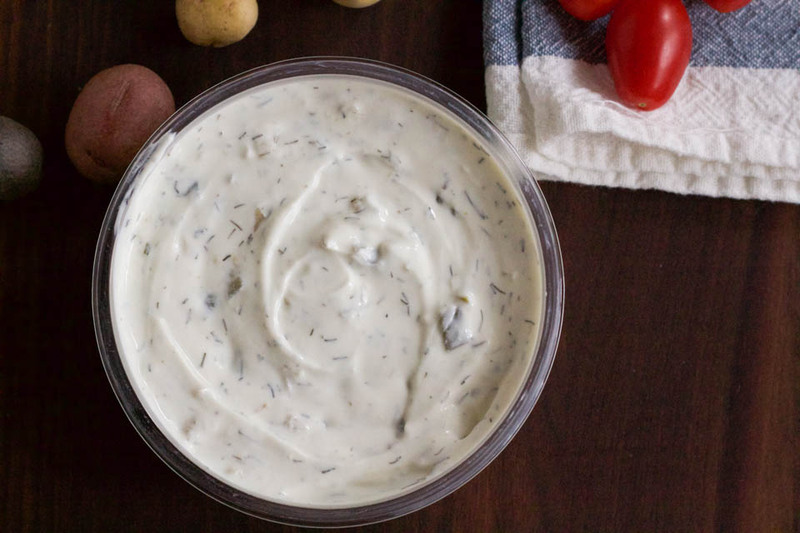 I need to look for those Greek yogurt dips…such a great addition to so many delicious recipes, especially your potato salad. It looks fantastic! Love this version of potato salad! Perfect for spring with the peas and dill. And I can make it any time of year because I always have frozen peas and I know where to get that Greek Yogurt dip! Totally can be made with frozen peas, especially good quality ones! Thank you so much for sharing this too :). 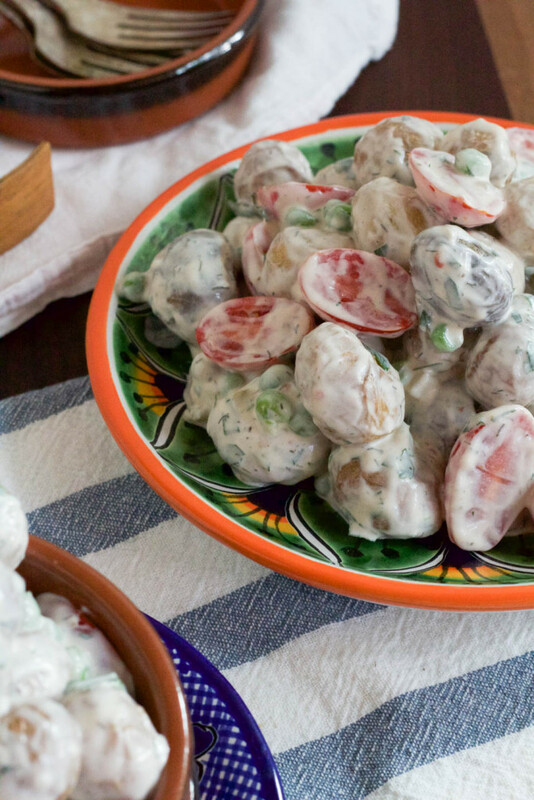 Yogurt dressing is such a great idea for potato salad! I wonder why more people don’t do it? This looks so good! My thoughts exactly! That is why I made it, bring it to light. Mayo is good, don’t get me wrong. But this yogurt dressing is WAY better! Thank you. Have a great weekend, Eileen! I love the idea of using this dip on the potatoes! How easy and the tangy, dill flavor would be perfect. You are making me feel I better make this over the weekend. Enjoy Dave Matthews Band. I’ve seen him a few times when they were just getting popular. So fun. It is so good! Thank you so much, I am very excited. That’s great you got to see him early on. I just saw a video of his early days, he looks like a baby! Sabra’s Cucumber Dill is one of my favorites! I love how creamy this potato salad is. Yum. Me too! It is so not undressed lol! I made a potato salad with this dip too! Yours looks amazing – and thanks for linking to my mushrooms! Great minds lady!!! Of course, I am so making it soon!